Supreme Deck is one of the leading Trex deck installers for Michigan. We are a TrexPro Platinum builder that installed over 125 Trex Transcend, Enhance and Select decks in 2017. All of our Trex decks come with a manufacturer 25 year warranty. We specialize in the construction, Building/Repair of decks, and sun-rooms. Supreme Deck is a trusted custom deck building company that services the Metro Detroit, Ann Arbor, Brighton and South Lyon (MI) Michigan areas. We are detail and quality oriented providing you the best service in the custom deck building & construction industry. Supreme Deck Building is a licensed and insured Michigan custom deck construction company. We can build a wood or composite deck using Azek, Timbertech, Fiberon, and Trex decking materials. Our rail systems are typically constructed of Deckorators, Cedar, Trex Transcend, Trex Select, Trex Signature, and Pressure Treated lumber. Call us today for scheduling and more information about our deck restoration, cleaning, repair, and building services. Supreme Deck Builders offers free in home deck estimates and offers great decks for less and faster than the competition. Searching for “deck builders near me” or trying to find a highly recommended deck builder? We have serviced the Michigan area since 1991 and can build Trex decks for less than most contractors to save you money. If you have a cedar deck that is rotting let Supreme Deck Builders evaluate it and give you a quote for a re-deck. Deck replacement is becoming popular and by saving the under-structure we can save Michigan homeowners a lot of money. Supreme Deck is one of Michigan’s most trusted and best deck builders. We consider ourselves one of Michigan’s best deck builders. 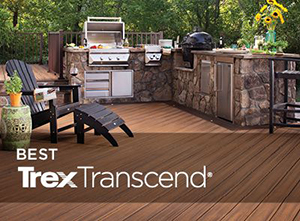 We invite you to come see your new Trex deck in person at our showroom in Livonia. We build and repair decks all year round…. A Michigan Custom deck builder that’s serious about delivering superior results to every one of their clients is exactly what you need if you’ve been considering installing a new deck or replacing your existing wood deck for your home in Southeastern Michigan. Don’t trust your project to just any unlicensed deck builder in Metro Detroit, Michigan. We are licensed and insured in Michigan and were one of the top Trex decks installers for Michigan for 2017. If you are planning on installing a Trex deck and are getting estimates, make sure you hire a TrexPro Platinum installer. Most homeowners don’t know that in order to get the 25 year warranty on your Trex deck, it must be installed by a certified TrexPro installer. We work hard to be the best custom deck builder in Southeast Michigan. We will do everything in our power to ensure we install the deck you’ve been looking for. We take a lot of pride in developing your plans and ideas into the right deck to compliment your home’s existing style and decor. A Michigan deck builder that’s serious about delivering superior results to every one of their developing the concept to designing the deck all the way through construction and all of the detail work. Supreme Deck has everything that it takes to deliver the right outdoor composite Michigan wood deck for you. You’re sure to see that we’re dedicated to developing a great new space that really brings you together with your family or friends in a comfortable and enjoyable environment. As a top of the line Michigan deck builder, we feel that your deck should help to increase the value of your house and your appreciation of the time that you spend at home. When building your deck, we work hard to keep your plans and ideas at the center of everything that we do so that you can rest easy knowing that you’ll end up with exactly the kind of deck that you’ve been hoping for. You can relax knowing that through great communication and a dedication to your needs, you’ll be totally satisfied with your deck and thrilled with the way it compliments your home. We know that you’ve been considering building a deck for some time, and we do everything in our power to make sure that you’re completely comfortable with the process each and every step of the way. You’ll see that we take a lot of pride in bringing your dreams to life, and that we work hard to provide you with as many options as we can in terms of the final outcome. You’ll definitely appreciate how knowledgeable, professional and friendly our craftsmen are. Call us today! With more than a decade of experience building decks in Michigan, we’re positive that we’ve got everything it takes to be the perfect Michigan deck builder for you. You’re sure to be happy with our wide range of material selection and designs that are focused on delivering the right new deck for your home. Whether you’re looking for a new composite, PVC, cedar, redwood, or Pressure Treated, or another type of wood deck, we’re certain to have just what you need. You’ll appreciate our accurate estimates, dedication to your deadlines, and our friendly, knowledgeable and talented craftsmen. We are Contractors or Deck Builders you can trust, who will deliver the results you want. Supreme Deck Restoration, Inc. also specializes in Deck Cleaning, Refinishing, and Repair. Contact us at 734-432-0099 to arrange a deck construction or deck replacement estimate. We’re committed to implementing only the most modern techniques and best practices in our industry, and to providing only the highest quality products. You’re sure to see that we stay focused on your ideas, and never make compromises when it comes to your expectations. We are a licensed Michigan deck contractor that takes pride in the final result. We offer a wide array of materials and styles to choose from. When it comes to being the best deck builder for all of your needs, we understand that it takes more than the most well trained, creative craftsmen and the highest quality products. It takes a real devotion to providing the absolute best for each and every one of our customers. When you’re ready for the deck of your dreams, give us a call! Composite and PVC decks are the latest” low maintenance” deck trend. We feel wood decks in Michigan are still the time tested best value for deck. Many people that have had an unlicensed contractor install a composite deck will tell you that they have issues with mold, hidden fasteners, miters, or warping of their composite deck. To get the 25 year Trex warranty you need to hire a certified TrexPro installer. Do your research before installing a composite deck and make sure you hire a Trex certified contractor. 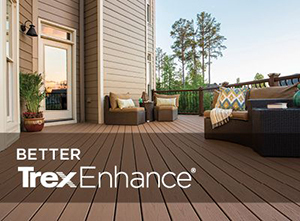 Supreme Deck is one of Michigan’s largest installer of Trex decks and certified as a TrexPro Platinum installer. Understand, that there are many materials to choose from and each material must be installed to the manufactures specifications or you will have problems with the products. The gaping, joist spacing and type of fasteners used on a composite deck need to be to manufactures specifications or you may encounter problems. If installed right, Trex decks with a PVC wrap such as Transcends, Enhance, and Select hold up the best to Michigan weather. Certain composite materials will require cleaning a couple of times a year to make it look good again. (Good—not, “Like New”). Our Deck Cleaning division services hundreds of composite Trex decks each year. If you install a composite, Trex, or PVC deck just remember you will still have to clean it. Ipe or Mahogany will likely have a durability of 40 years if sealed or oiled yearly. A wood deck can be refinished every few years to look like new again and be able to replace rotted boards to match. You can’t refinish a composite deck—you simply replace it. Composite and PVC decks typically run 2-3x for materials more than a wood deck. The maintenance costs are built into the price, so you pay the maintenance up front. By deciding to go with a synthetic deck we feel that Azek, Trex Transcends Tropicals, Timbertech, or other PVC decks are the best choice. If you invest the money in a composite deck, it is best to go with Timbertech, Trex Transcends, Fiberon decking, or similar PVC type of decking material in Southeast Michigan. 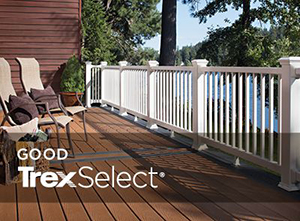 Supreme Deck is a certified Trex, Timbertech and Fiberon decking contractor for Michigan. Supreme Deck Builders is a TrexPro Platinum installer for Michigan. TrexPro® Platinum contractors have achieved advanced product and installation training and make up a select group of talented and dedicated professionals experienced with using Trex products to craft the deck of your dreams. Searching for deck builders near me? Below are some cities we service in Michigan (MI). We offer great decks for less.